The majestic American Bald Eagle is a bird of prey found in North America. The American Bald Eagle is classified as one of the birds of prey or a raptor. Birds of prey are identified by the fact that they are completely carnivorous and obtain all their required nutrients from their prey. Birds of prey include Eagles, Hawkes, Falcons, buzzards, voltures, and even owls. 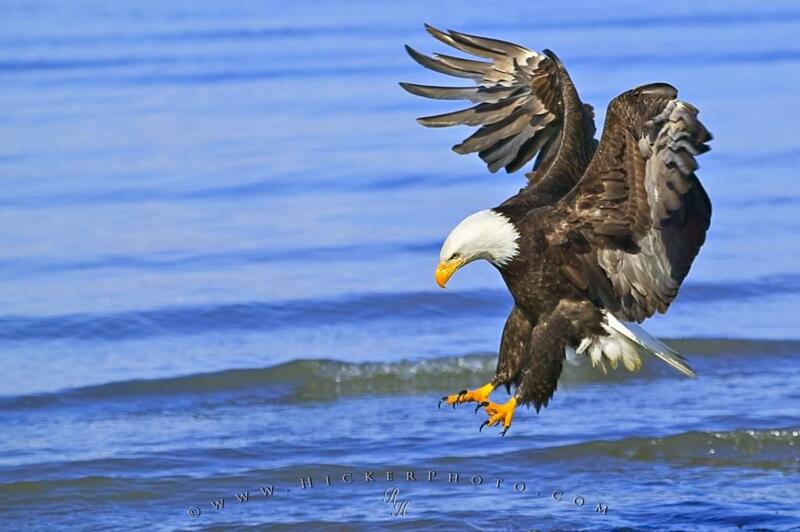 I photographed this picture of a fishing eagle near Homer in Alaska, USA. Eagles are my favorite birds of prey to photograph, They are very fascinating animals to watch in nature. It is a very powerful moment when a eagle has set his eyes on a salmon, he turns in the air, does a 180 in a split of a second and comes down with full speed, which it needs to be able to lift off again,hopefully with a fish attached to its feet. Bald eagle, bird of prey or raptor, split seconds before it catches a fish, early spring, Homer, Alaska, USA. Photo of a fishing Bald Eagle (bird of prey) in flight, Homer, Alaska.